Virna Jandiroba may not be a household name yet, but that could soon change. The undefeated Brazilian will defend the Invicta Fighting Championships strawweight title against the once-beaten Janaisa Morandin in the Invicta 31 headliner on Saturday at the Scottish Rite Temple in Kansas City, Missouri. Their five-round battle shoulders the marquee for an eight-fight card, which streams to UFC Fight Pass at 8 p.m. ET/5 p.m. PT. Jandiroba, 30, has delivered 10 of her 13 professional victories by submission. She last competed at Invicta 28 on March 24, when she eked out a split decision over Japanese standout Mizuki Inoue to improve to 13-0. Jandiroba, who operates out of the Fight House camp in her native Brazil, owns other notable wins over Amy Montenegro, Ericka Almeida and Lisa Ellis. Just 23 years old, Morandin rebounded from her only career defeat — a unanimous decision to Livia Renata Souza a little less than a year ago — at Invicta 26 in December, when she outpointed Kinberly Tanaka Novaes across three rounds to up her record to 10-1. Unlike Jandiroba, she prefers to do her business on the feet: Five of her 10 wins have come by knockout or technical knockout. In the flyweight co-main event, Ultimate Fighting Championship veteran Pearl Gonzalez toes the line against the surging Daiane Firmino at 125 pounds. 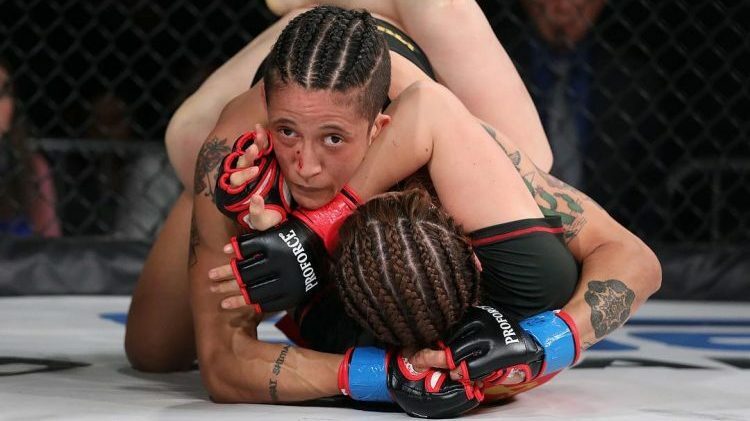 Gonzalez has rattled off back-to-back victories since she linked arms with Invicta, as she followed a unanimous decision over Kali Robbins in March with an armbar submission of Barbara Acioly on May 4. Firmino, meanwhile, will enter her promotional debut on a three-fight winning streak. She has won nine of her past 10 bouts — a run that includes a November 2014 technical knockout against Ariane Lipski. The regional mixed martial arts scene has also heated up across the pond. The fate of the vacant Cage Warriors Fighting Championship lightweight crown will hang in the balance when Paddy Pimblett collides with Soren Bak in the Cage Warriors 96 main event on Saturday at Echo Arena in London. In the co-headliner, Jonas Billstein challenges Lee Chadwick for the Cage Warriors middleweight championship. Cage Warriors 96 “Pimblett vs. Bak” streams to UFC Fight Pass at 1 p.m. ET/10 a.m. PT. Other fights to monitor include Jack Grant vs. Aleksi Mantykivi and Nicolas Dalby vs. Roberto Allegreetti.